The British version of our Consumer Institute is the Good Housekeeping Institute. It publishes “triple-tested” recipes in a series of soft-cover cookbooks under the title Easy to Make! Two recent publications are Chicken and Family Meals in Minutes. The cover of the latter put me right off because its layout is cluttered and the picture looks yucky. It took ages before I could bring myself to open it, but I was pleasantly surprised when I finally had a look: Beside the usual 100 + recipes I found valuable information from planning midweek meals to shopping guidelines and timesaving tips. The meals range from standard fare, such as mac’n’cheese and fish pie to fresh takes on pork chops (with yogurt sauce), beans (chilli bean cake) and chocolate pots (“cheating” with bought custard). I tried several of the recipes and found the Easy Pea Soup made from frozen peas to be quite tasty. Apart from seasoning it only has four ingredients and is a really speedy light meal. I also liked the idea of Falafel, Rocket and Soured Cream Wraps and the Cumin-spiced Gammon. I haven’t eaten gammon for more than a decade and can’t remember seeing it anywhere, but then again – I haven’t really looked for it. If you, dear readers, can enlighten me, please do. I wasn’t so sure about calf’s liver or the quick crab cakes. Not because I wouldn’t like to eat these meals, but because of the price of fresh crabmeat and the yuk-effect liver seems to have on a lot of people. Inside, some of the pictures created the same impression as the one on the cover: The use of pale yellow-green dishes to display pale yellow meals is not very appealing. The food stylists’ pictures we’re all used to don’t just photograph food, they colour match and spray with water or oil or other substances to make the dish look fresh and, of course, completely inedible. So maybe I should change my way of looking at those photographs of real food and stop whining. I can’t stand the fact that almost every dish made in a bistro or other dining place contains chicken. The former Sunday roast has become almost a seasoning. I eat it only on occasion, when I can get fresh organic, or at least free-range, chicken. That’s why reviewing a cookbook dedicated to the feathery beast presented a real challenge. The authors didn’t seem to pick up on an obvious inconsistency: They recommend free-range eggs, but don’t spare a thought for the meat bird. More than 90 percent of layer hens in New Zealand are raised in cages no private bird owner could get away with. And the chickens raised for meat haven't got an easier life. They never see daylight either. But we vote for this cruelty by insisting on cheap eggs and meat. Apropose of inconsistencies: Off and on I’ve worked in the staff canteen of a large chicken-processing plant and the sight of a conveyor belt transporting thousands upon thousands of dead birds haunts me. The Chicken cookbook, like all Easy to Make! books starts with a useful chapter on basics. It tells about ways of preparing the chicken, making stock and stuffing, preparing accompanying vegetables and flavourings, using herbs and spices, cooking rice, grains and potatoes and even provides tips for general food storage and hygiene. Despite my reservations I must admit the recipes had me drooling. I’m looking forward to an occasion when I can prepare a batch of the Tangy Chicken Bites (with fruit chutney and sour cream). Also very tempting sounded the Warm Lentil, Chicken and Broccoli Salad. Recently I had some leftovers from a whole roasted (free-range) chicken so I tried the Chicken, Bacon and Leek Pasta Bake – very moreish! 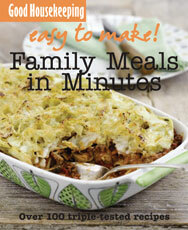 Not that I mind, but quite a few of the recipes from Family Meals in Minutes get an encore in the Chicken book. I don’t think the decision on buying cookbooks shouldn't be based solely by their price, but it is, nevertheless an important aspect. At $15 the Easy to Make! books are affordable – each recipe costs less than 15 cents. One can’t grumble about that. The books are distributed in New Zealand by Harper Collins and are available in every book shop or online from Fishpond, Mighty Ape and The Nile (cheapest).